Today was the backbone cleaning day. James washed everything on top, cleaned out the locker, and made multiple phone calls to the marina office regarding our slip. While we were gone, a different boat was put in our adjoining slip. We were unsure if we could both fit into the slip, but with help from the marina, we managed to put Ragtime back into E34. We had docked on the A Dock extension on Monday morning because of the tidal current. I cleaned out the refrigerator, pantry, began packing, plus did laundry. While packing the multitude of clean clothes that we never even wore, I fully realized I had over packed! The winter clothes that were sent home with Rob and Minta had all been worn, so I did ok in that department. I thought we would need more summer clothes because we would sweat more, but it turns out that I was able to wash at least once a week. Like a dog and a fire hydrant, I never passed up a laundry. Note to self for future trips: a week’s worth of clothing is enough. When I am on the water, I don’t worry about wearing shirts and shorts multiple times. Just give me plenty of undies!!! As I was folding HOT clothes from the dryer, I reminded myself that commercial dryers do not seem to have a low setting no matter what the button says. For future trips, I will rethink bringing tops that say to dry on low. We are leaving today. After hitting it hard for two days, we have cleaned and put Ragtime to “sleep” for a few months. We plan to have her hauled out for a bottom job this summer. There are also numerous small repair projects that we left in the hands of our capable boat management guy, Mallory. We will not be back until the end of August when we will be back for a wedding. We both have mixed emotions as we leave Charleston. It has been a great 11 weeks, but there are portions of our lives that we definitely miss back in Kingsport on dry land. 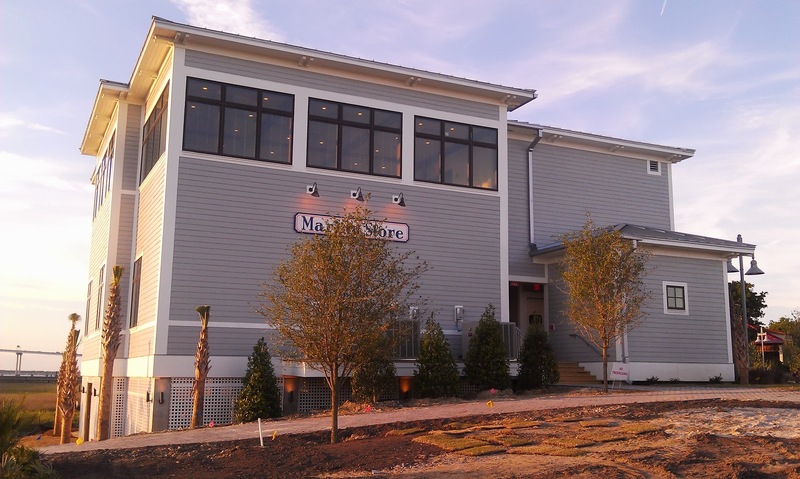 While we were gone, they made significant progress on the new restaurant at the marina. 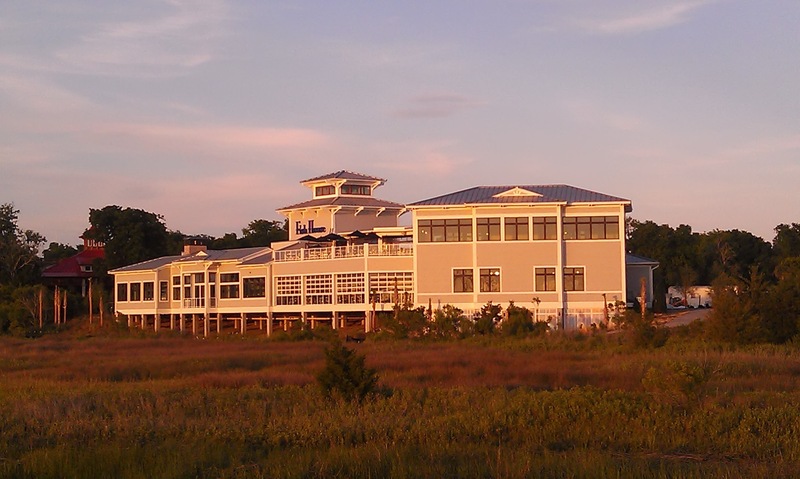 Fish House is slated to open the end of the month which is tomorrow. I don’t think they will make their deadline but maybe next week. There is also a marina store adjoined to the restaurant. We will look forward to checking them both out in August. This will probably be my last letter to you. Mrs. Little talked on the phone with Mrs. Harrison earlier and said graduation was Wednesday. Wow! The year has flown by hasn’t it? We are in Miamarina at downtown Miami. Today was a work day to get the boat ready to sail back to South Carolina. 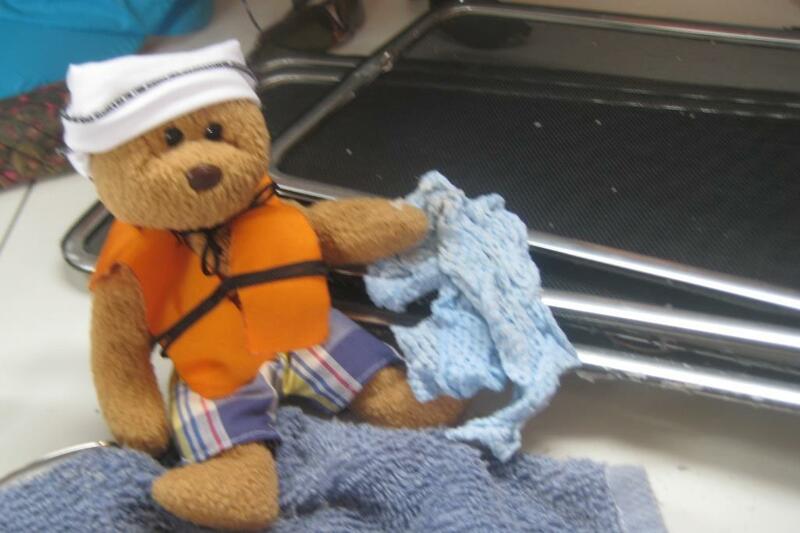 Captain James scrubbed the decks, and I helped wash the dinghy. There was salt and seaweed all over the boats. 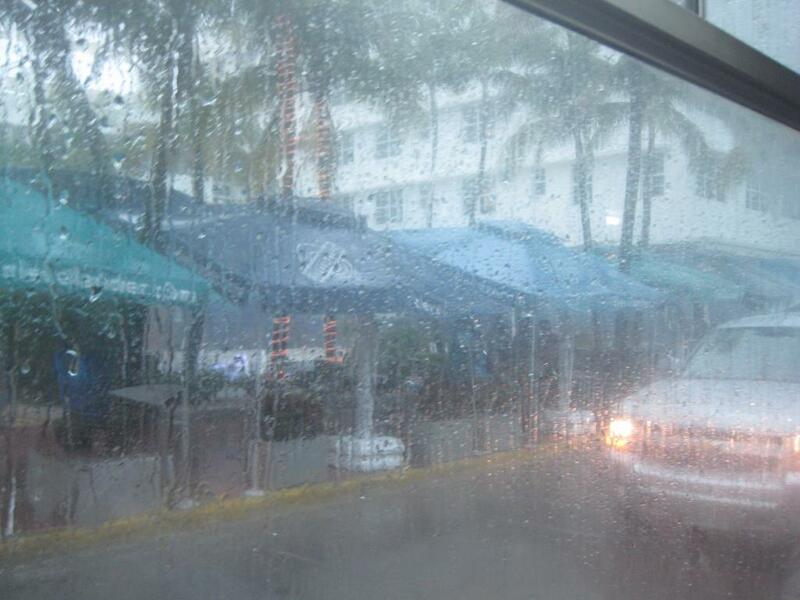 When we left Key West, it was quite windy with lots of big waves that splashed all over the boat. When the sun dried up the water, it left the salt. Mrs. Salyer, it was like a science experiment. I helped Mrs. Little wash the screens. See the salt crystals. While Mrs. Little did laundry, she left me to vacuum. Cleaning salt off screens…do you see the salt crystal in my paw? Even though I am tired after working hard all day, I am excited. Tomorrow I get to meet Mrs. Little’s son, Matt. He is flying into the Miami airport to sail back with us. Another friend of the Littles is coming also, Mr. Rob Fannon. His wife teaches art at Sevier Middle School. You will meet her next year. She is a sailor also. We are going to be sailing back day and night on the ocean to get back home quickly. If the weather holds, we should be home by the weekend. Everyone will take turns taking a watch (a certain number of hours to sail the boat) while others will sleep. Matt and Mr. Fannon are good sailors, so I feel safe. I have found a special place to ride on the boat when it gets rocky. See me in my little pouch. 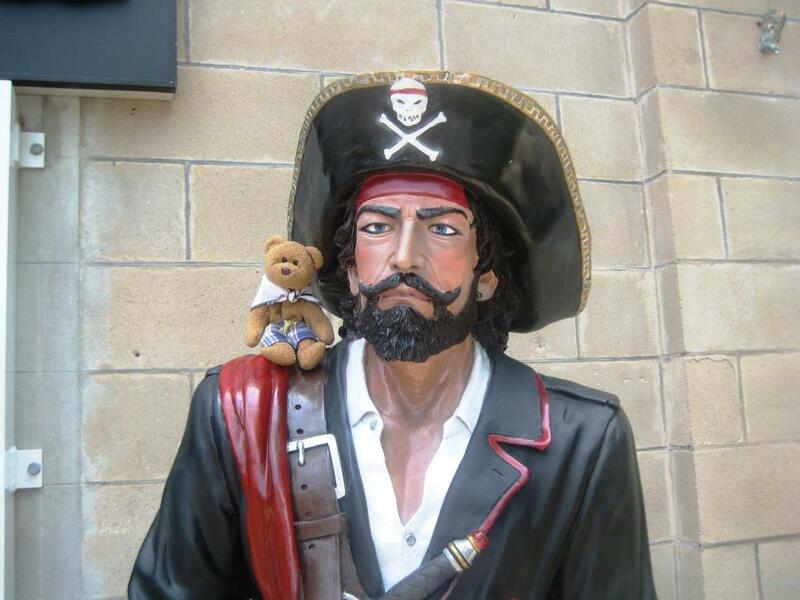 When it’s calmer, I ride on the compass with Captain James and help steer the boat. Sometimes I sit in the drink holder. It is a very comfy seat. Mrs. Little was going through her pictures and realized she had some pictures she hadn’t sent you. The closest thing to a video machine that I have played in 10 weeks! 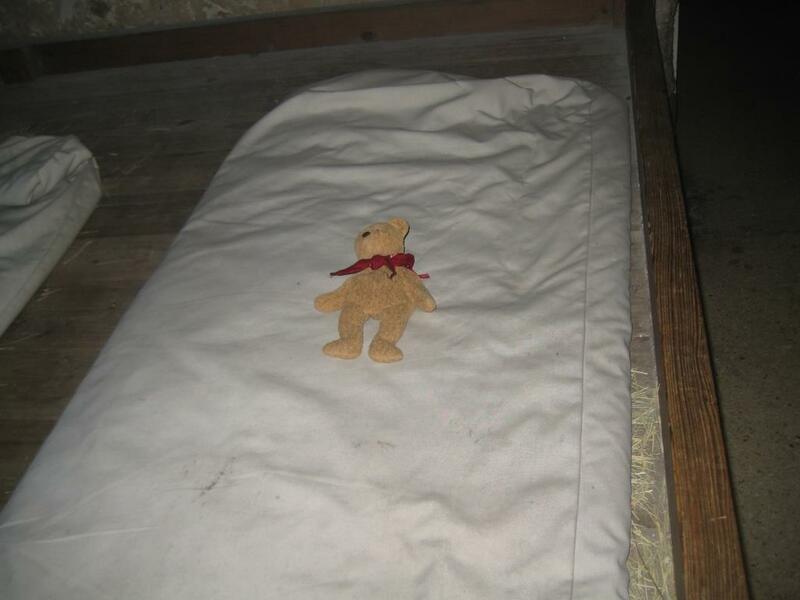 Bed made of straw in the old fort…wasn’t comfortable. Mrs. Salyer, I will continue to write you if we have Internet connection on the ocean. I will call you when I get back to Kingsport, so you can come get me, please. 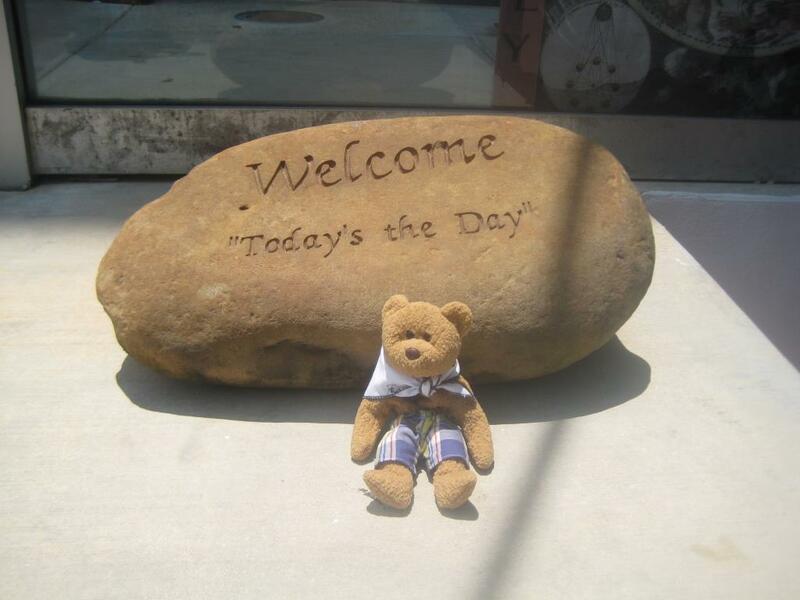 May 17, 2012 Dear Bear Cubs, I have been too busy to write you lately. 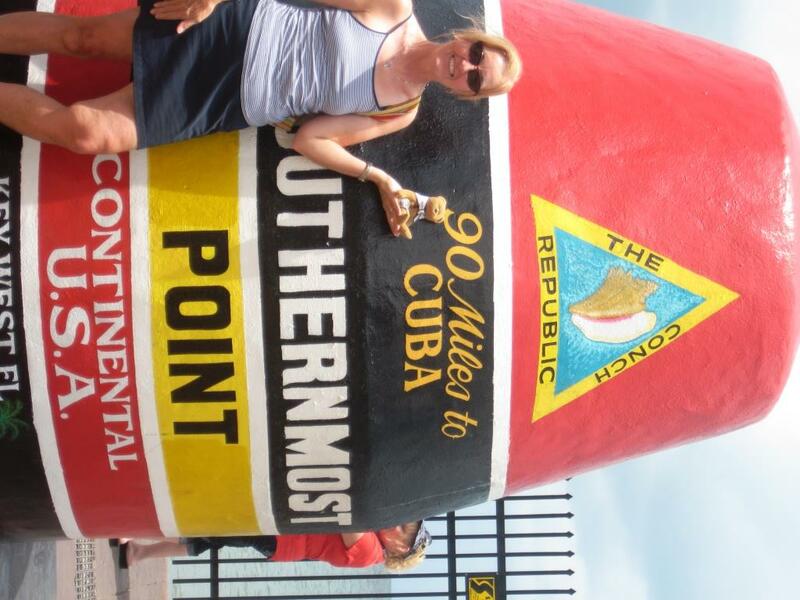 Last week we finally arrived at our end point of our trip-Key West, Florida. Key West is the last island in a string of island reefs known at the Florida Keys that are 150 miles long. 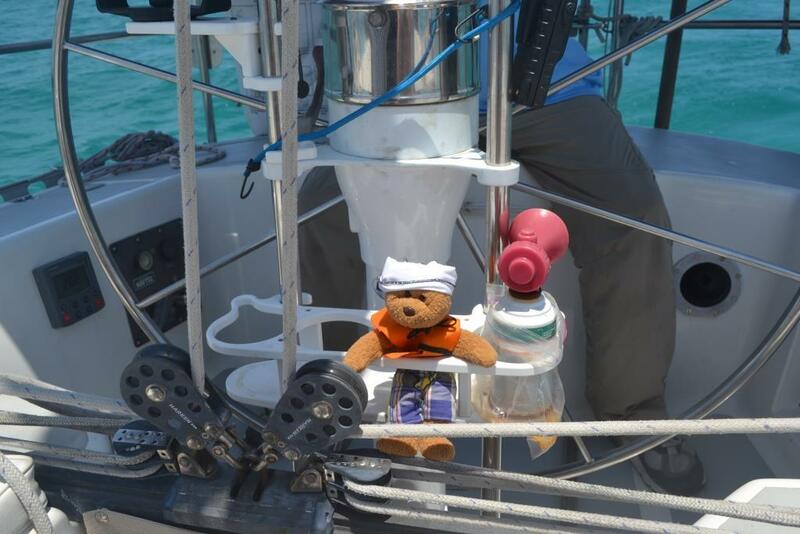 It took us three days to sail from Miami to Key West. There’s an easy math problem for you…approximately how many miles did we sail each day? 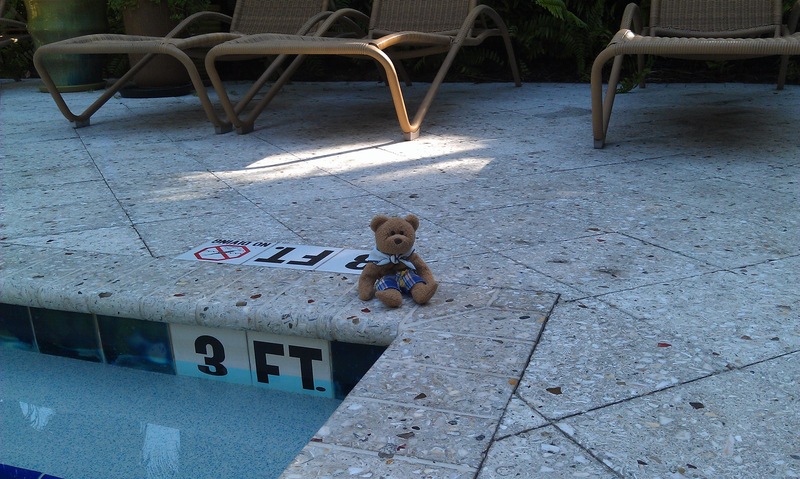 Would you like to hear about my adventures in Key West? We met some friends of Captain James and Mrs. Little. Uncle Chris and Ms. Anne flew to Key West to spend several days with us. They were very nice to me and treated me just like family. The most amazing thing was that we spent four nights in a resort hotel. 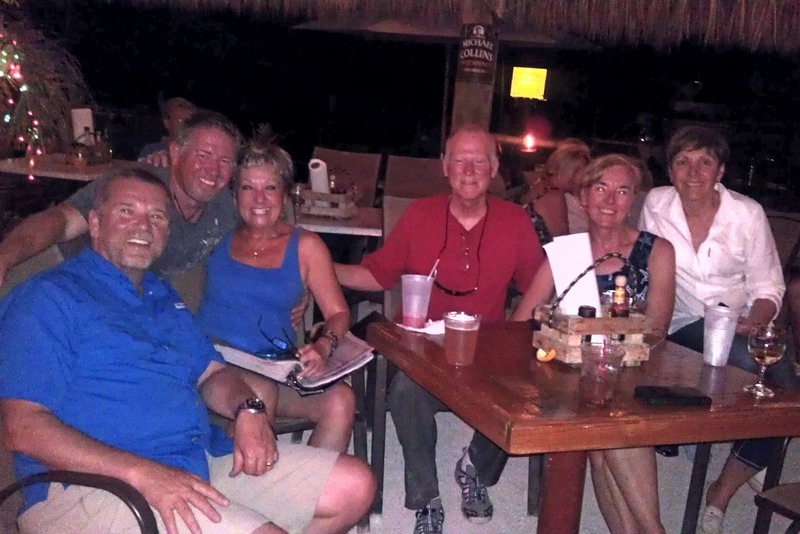 Uncle Chris invited us to stay with him at this beautiful place called Parrot Key Resort and Hotel. 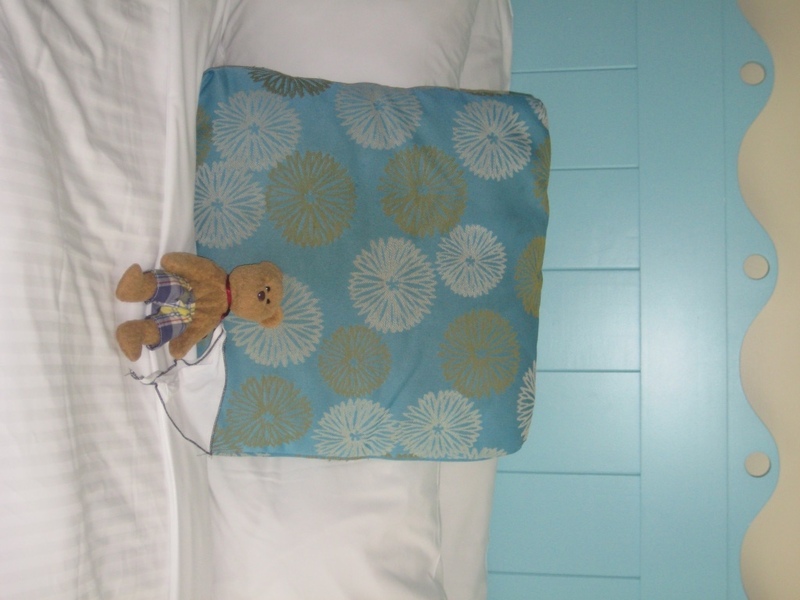 We had our own bedroom, and I even had my own BIG bed! Unfortunately the adults had so many activities planned for each day that I didn’t even have time to go swimming. We were so busy each day that I would fall asleep in Mrs. Little’s purse before we even got back to the hotel. 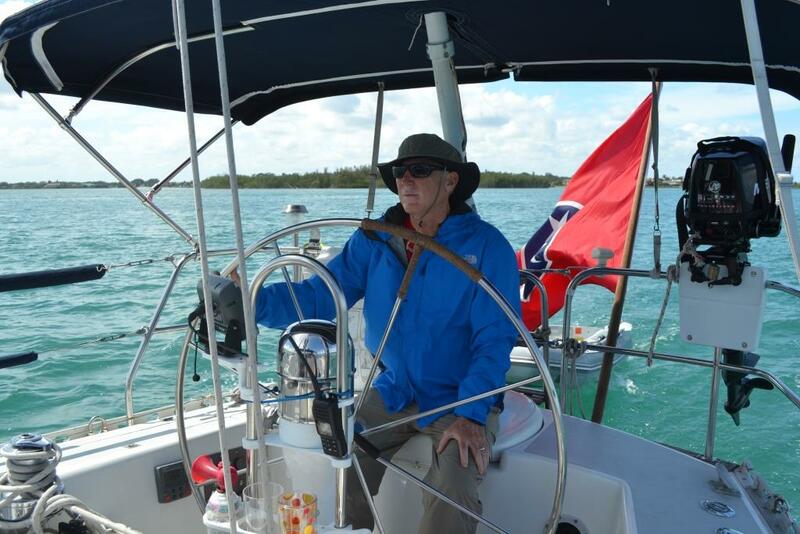 On Sunday we took Uncle Chris sailing on Ragtime in the Florida Bay. 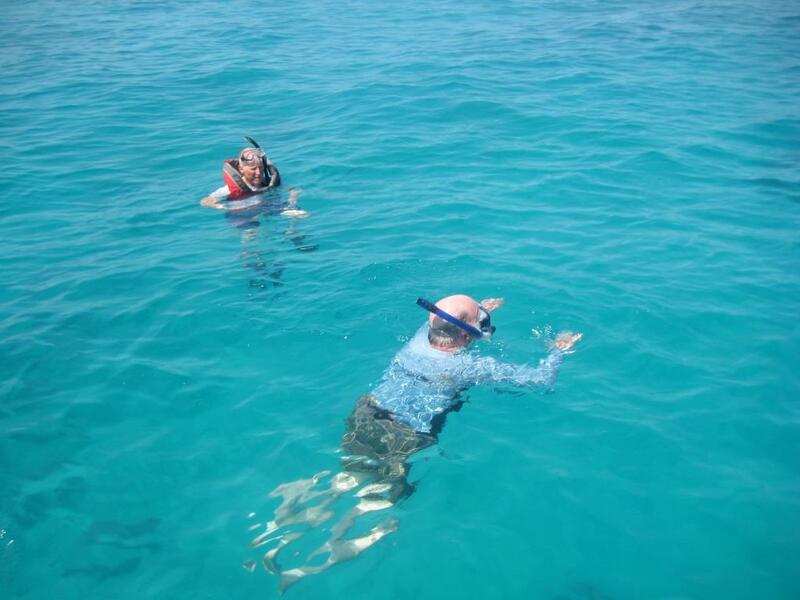 After sailing for a couple of hours, we came to a reef called Sand Reef where we could snorkel. Have you ever done that? I have snorkeled in Mrs. Salyer’s swimming pool, but she doesn’t have fish and coral reefs in the bottom of her pool. It was so exciting to see the tropical colored fish and the interesting shaped corals growing on the sea floor. At first I was scared because all the fish were bigger than me, but Mrs. Little assured me they wouldn’t bother me. In fact they mostly ignored us. I don’t imagine they’ve ever seen a bear. Maybe they thought I was a baby human??? 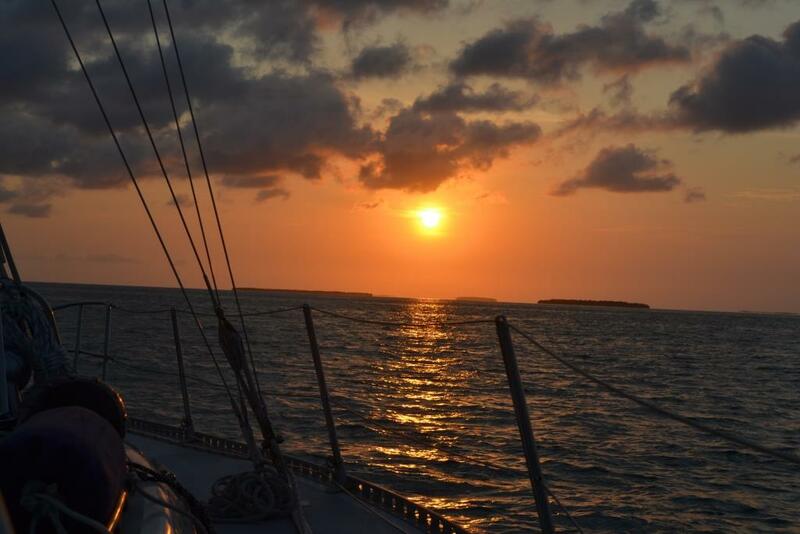 After snorkeling for a few hours, we sailed back to Key West and watched the sunset in the Gulf of Mexico. Yes, not the Atlantic Ocean. 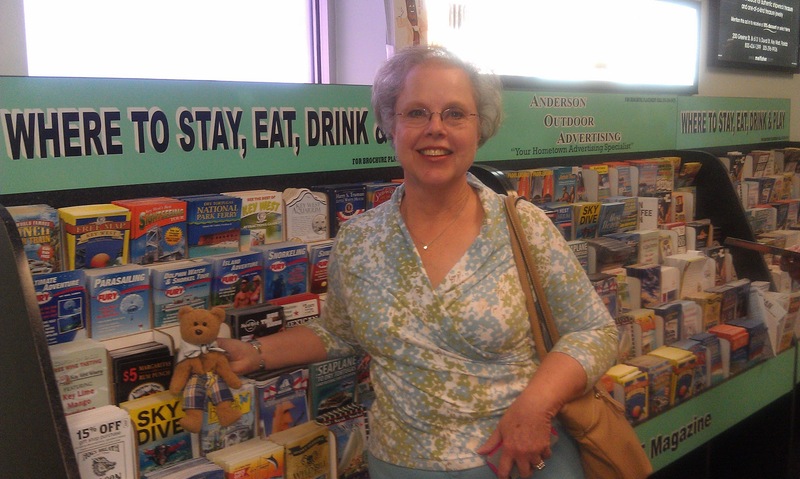 Ask Mrs. Salyer to show you Key West on a map. It was a beautiful sunset. Apparently watching the sunset in Key West is a touristy thing because they even have a place on shore called Mallory Square where hundreds of people gather each evening to watch the sunset. On Monday Ms. Anne’s flight arrived. We drove to the Key West airport in Uncle Chris’ rental car to pick her up. She was so happy to finally meet me. I guess she’s been reading about my adventures. 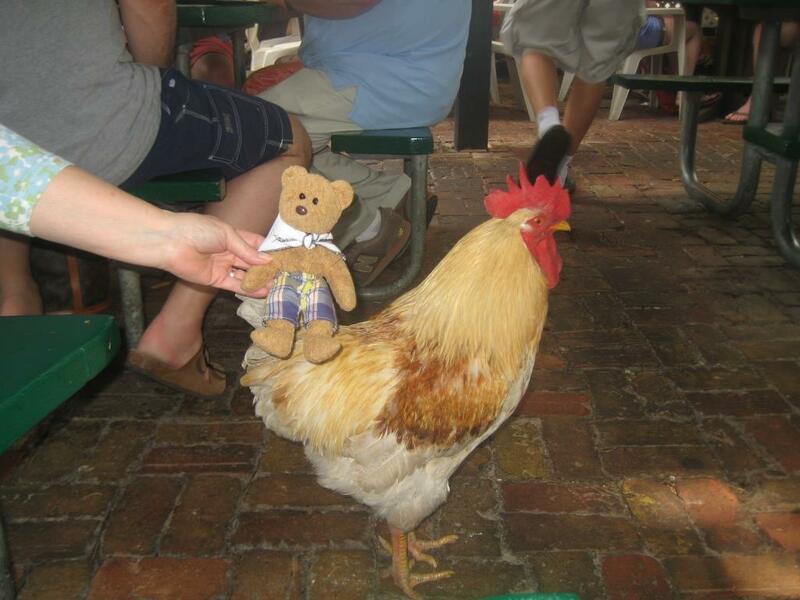 I was hoping the rooster would give me a ride. They are everywhere! 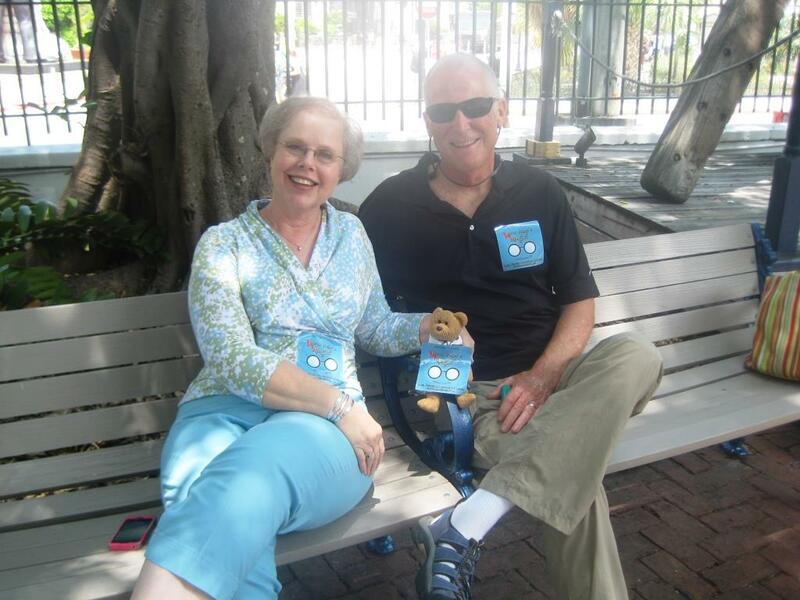 After letting Ms. Anne deposit her suitcase at the hotel, we drove downtown Key West for a sightseeing day. 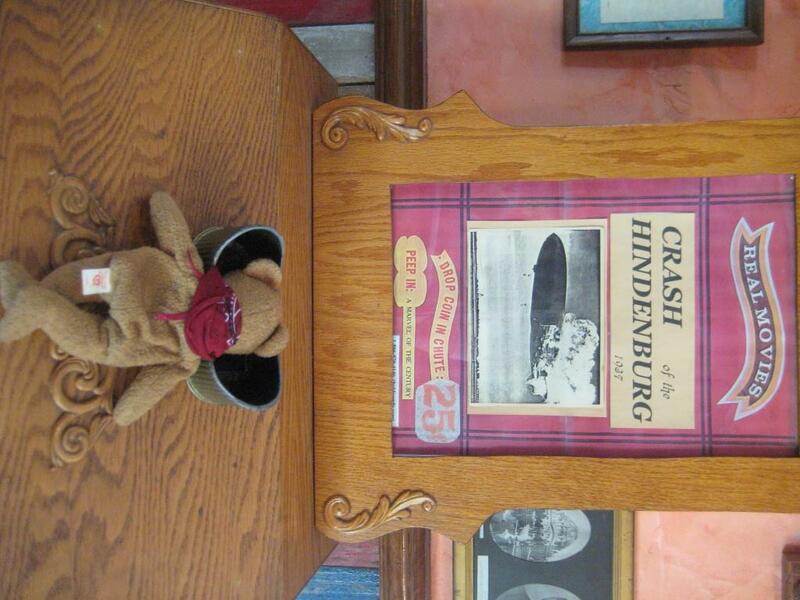 We went to three museums: the Truman Little White House, Mel Fischer Treasure museum, and the Ernest Hemingway House. They were all very interesting. Maybe Mrs. Salyer will let you look up these places on the Internet and read more about them. 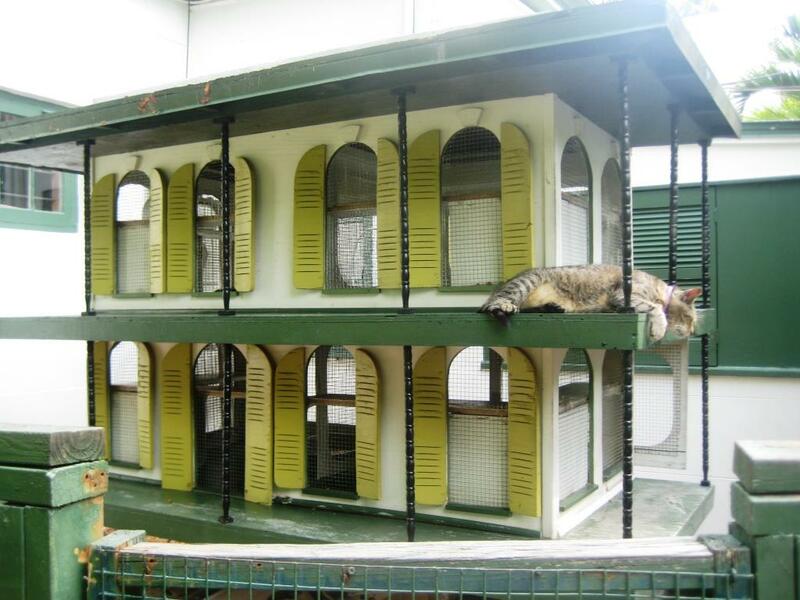 I think my favorite was the Hemingway House because of all the cats. 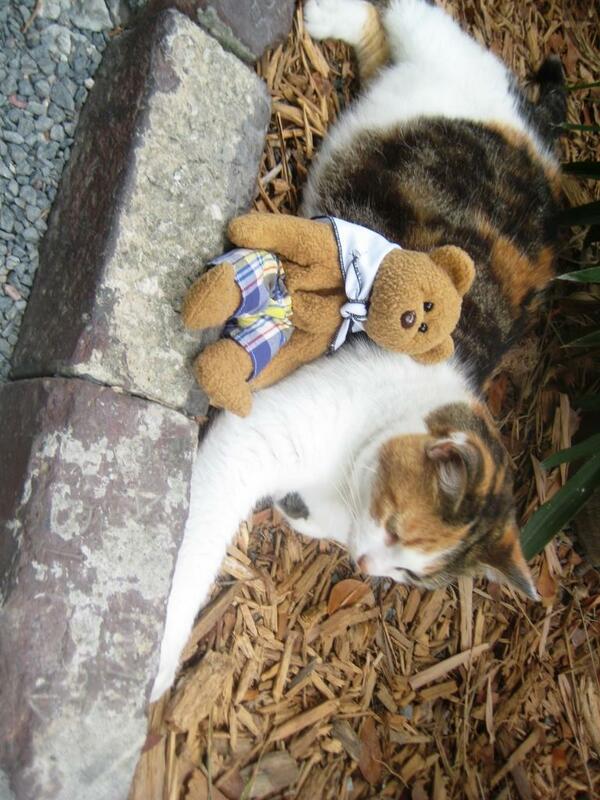 Apparently Mr. Hemingway had this cat that had kittens and then more kittens. 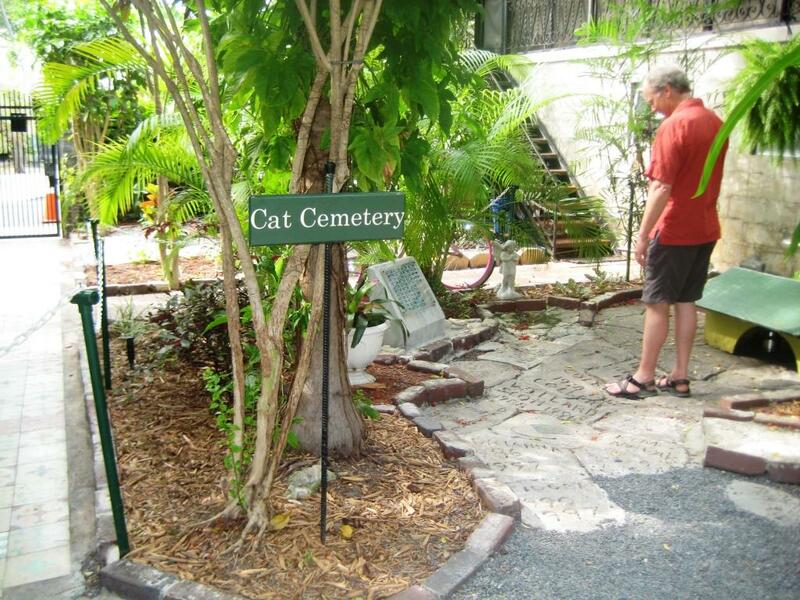 Now there are more than 40 cats living at the house and are all relatives of that first cat. They were quite friendly. They are also polydactyl which means they have 6 toes!!! Some have the extra toes on just two feet and some on all four. Something else you should research. I asked Mrs. Little to take my picture with the pirate. I have on my ticket to go to the Mel Fischer Treasure museum. 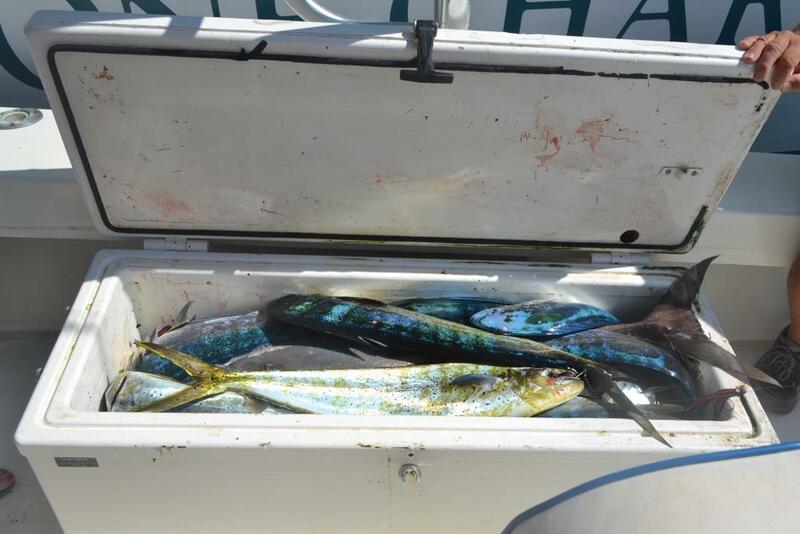 On Tuesday we went sport fishing. Uncle Chris hired a man by the name of Captain John to take us out in his big fishing boat. We motored a long way off shore, about 20 miles. 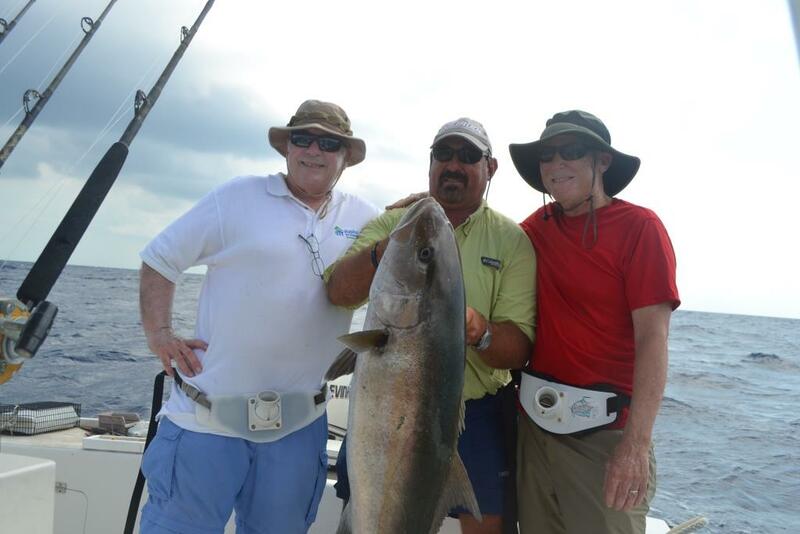 Captain James and Uncle Chris caught a humongous fish called an amberjack. It weighed about 65 pounds and took them 45 minutes to reel in. It was strong and fought so hard that they had to take turns with the reel. When the fish finally was caught, everyone was exhausted, even the fish. I sort of felt sorry for him, but he was put in the ice locker. Next Captain John took us to a place where we caught 13 dolphins. I was concerned when they said dolphin because I love those creatures but these are not the same kind of dolphin. They were about 24 inches long and look nothing like the dolphins you see swimming in the ocean. After we got back, Captain John cleaned the fish and gave us a bag to take with us. We took it to a Thai restaurant that he recommended. They cooked it for us. I have to admit, it was delicious! Wednesday was our last day with Uncle Chris and Ms. Anne. We had breakfast at a French restaurant and then went to the Key West Lighthouse and the southernmost spot in the United States to take our picture. 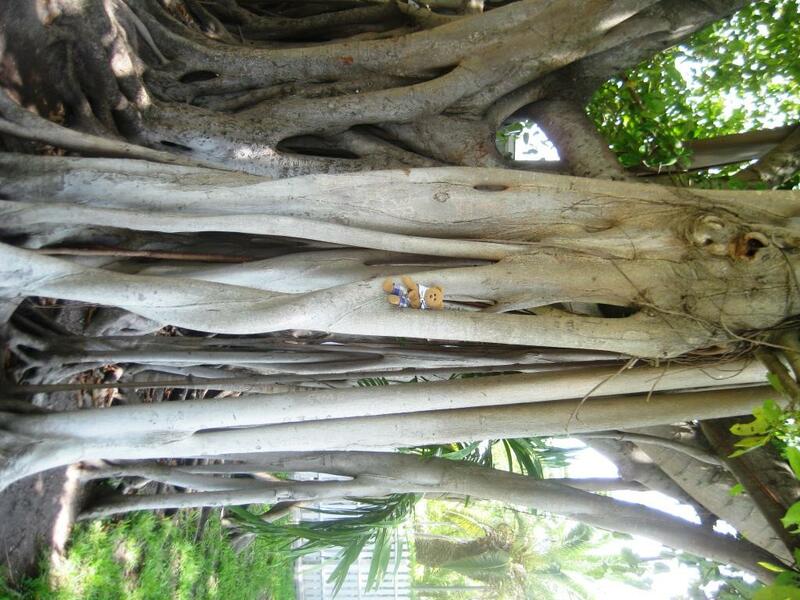 At the lighthouse I had my picture taken in a banyan tree. Notice how the branches grow to the ground. Something else to check out. I hated to see Uncle Chris and Ms. Anne leave, but they had to go back to work. Today is my birthday. I cannot think of a better way to spend it than on the water except if my friends and family could be with me to share this day. I had said last week that I would like to be in Marathon, FL for my birthday, and it’s going to happen. James is planning to take me out to eat tonight, and I will be able to get a hot shower with unlimited water! I’ve not had one of those in going on two weeks. YAY!!! Isn’t it amazing how when you do without, the little things become big things. Living simple is one of the aspects I like about sailing/cruising. Not that I don’t like flush toilets, unlimited hot water, a large refrigerator where everything stays the temperature it’s supposed to be, and Internet access whenever I want it. Doing without makes me appreciate more what I have, and I enjoy the idea of leaving a small footprint on our planet. 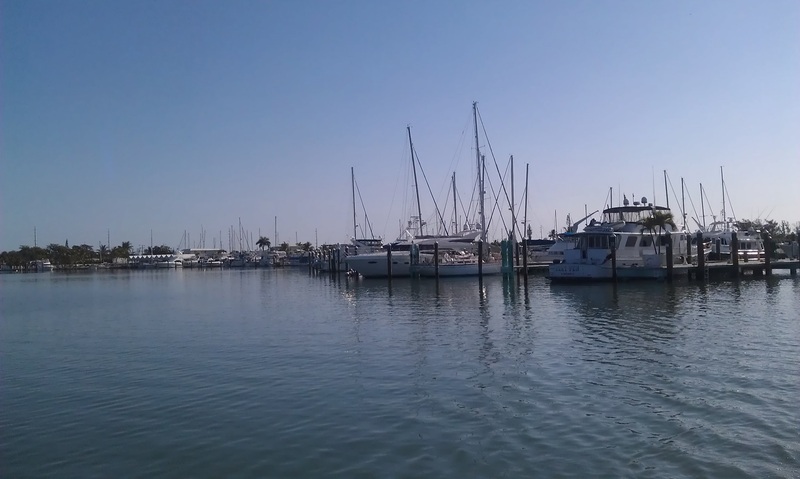 Saturday morning we left Crandon Marina after topping off our fuel tanks (they have the cheapest diesel in the Miami area), and sailed south to No Name Harbor, again. The last time we were there it was quiet with only a handful of sailboats and one or two motorboats. Not this time. It was crowded and noisy with motorboats of all sizes and kinds along with a few more sailboats than before. The motorboats came and went all day along with their very loud music. The majority of the boats had multiple girls in their requisite bikinis. James and I had decided that it was pre-Cinco de Mayo celebrating, but a fellow cruiser said it was just a typical Saturday. There was a cool breeze which made it nice to sit in the cockpit and people/boat watch. James also wanted to watch as other boaters anchored near us. When they got too close, he would give his very concerned look causing more than one to change their anchoring spot. One large cruiser became our central entertainment. First he came in and made multiple attempts to dock at the seawall at the pump out station with his bikini clad girlfriend who didn’t have any idea what to do with the boat hook. Finally they managed to tie up with some help. They pumped out and then proceeded to anchor behind us. Later in the day they decided to move and had great trouble anchoring to the extent of banging their anchor into the sailboat behind us. The girlfriend was helpless as they guy would run up to the bow and then back to the helm. Actually he wasn’t running which was part of the problem. We had decided he had too much drink. When he tried to anchor beside us, James suggested he move further up where there was more room. 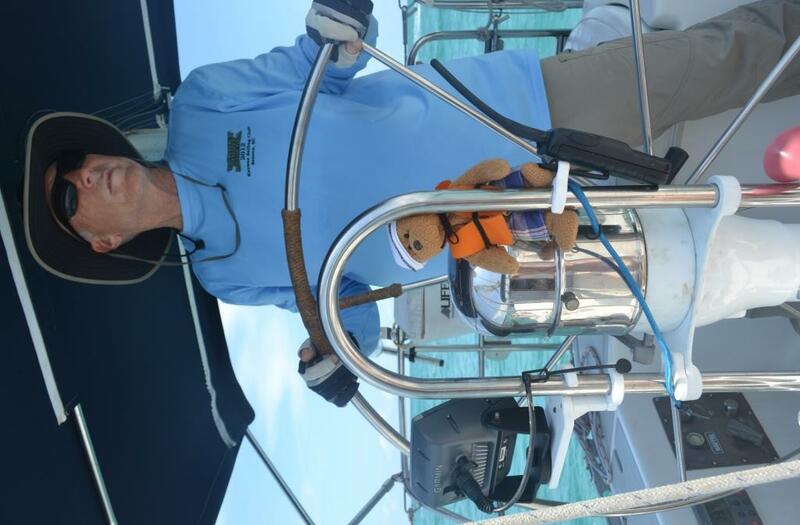 The next morning we arose around daybreak to begin our sail down the keys with our ultimate destination –Key West. With little difficulty we followed the “breadcrumbs” we had lain with our GPS several days ago along the Cape Florida Channel to Hawks Channel. Once in Hawks Channel we raised the sails and sailed at a good clip of 7 knots all the way to Rodriguez Key. 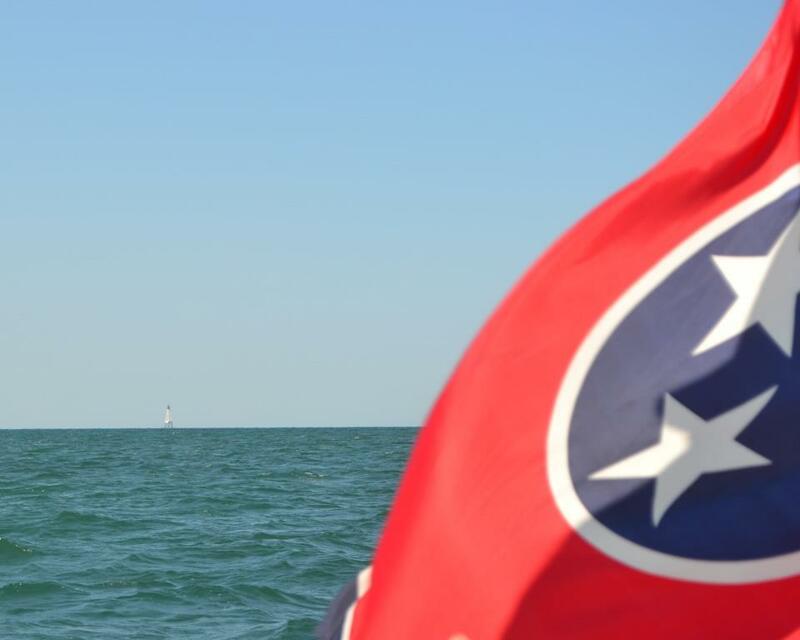 It was a gorgeous sailing day…perfect temperature and wind. Our first anchorage slipped at Rodriguez necessitating raising the anchor and trying again. Thankfully the second time we got a good hold because the wind howled at about 15 knots all night. 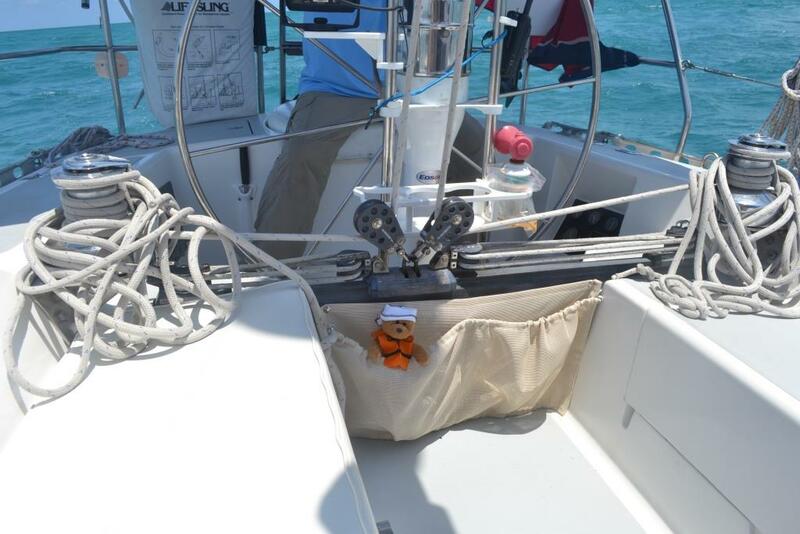 James had set his usual anchor alarm and got up several times during the night to check on our holding. We should have slept in the aft cabin in retrospect because we rolled and flopped around in the V berth like we were on a night sail. I must say I’ve had better sleeps. Again we arose around daybreak and were under way by 7:00 am. It was an overcast windy day with temperatures in the high 60’s for most of the morning. We dressed in long sleeves for the first time in a month. I had been concerned that it might be too hot in the keys; this was totally unexpected! Last week James had asked what I wanted for my birthday. I had replied to be in Marathon. My birthday wish was coming true as we motored into Marathon Marina in Boot Key about 5:00 pm. After the usual settling into the dock and showers, we walked to 7 Mile Grill for my birthday dinner. We had hamburgers…not fancy but appropriate. My mother always cooked us our favorite meal for our birthdays. Mine was always hamburgers! We brought their famous Key Lime pie back to the boat for later. James surprised me with a candle that he had weaseled out of the waitress. He proceeded to light it and sing “Happy Birthday” to me. We slept in on Tuesday morning and took it easy that morning. Marathon Marina has the best Wi-Fi yet from any marina so we took advantage. In the afternoon we walked to West Marine (sailors find it difficult to bypass) and then took a $5 taxi ride to Publix. While I was putting away our groceries, another sailboat came into the slip near us. Several of the men on the dock began helping them dock as they were having difficulty. The Island Packet’s new owners of less than a week are Paul and Paulette, Canadians who are working in the Netherlands at the moment. 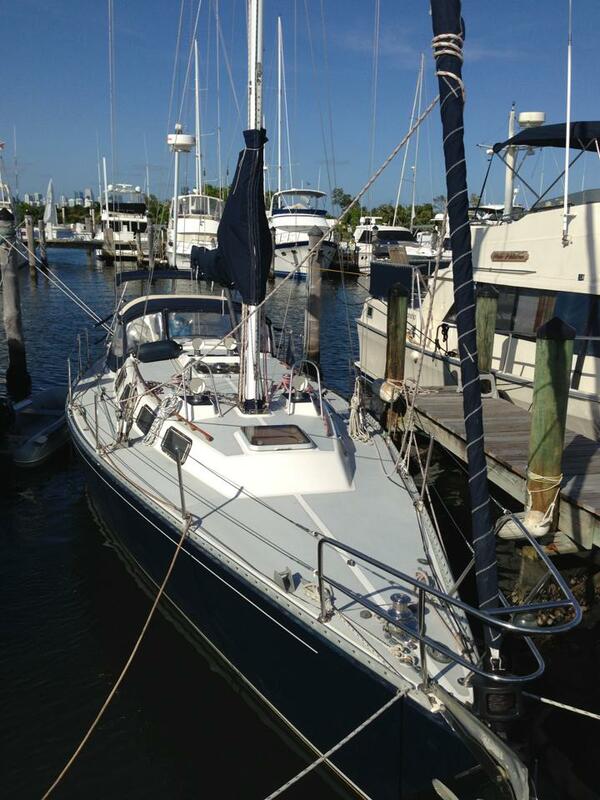 They had hired Captain Blaine, a licensed yacht captain, to assist them in sailing their new boat to West Palm Beach where it is to be shipped to Barcelona, Spain. Captain Blaine is a character who invited to go to Pirates Karaoke at the bar and grill down the street. It was a fun time listening to some rather good singers and others who were really bad but had a fun deprecating humorous attitude. Capt. Blaine being one of the good singers goaded us as a group into singing. After numerous rounds of drinks, we agreed to sing “Love Shack”. It was quite comical. I was glad it wasn’t being recorded! 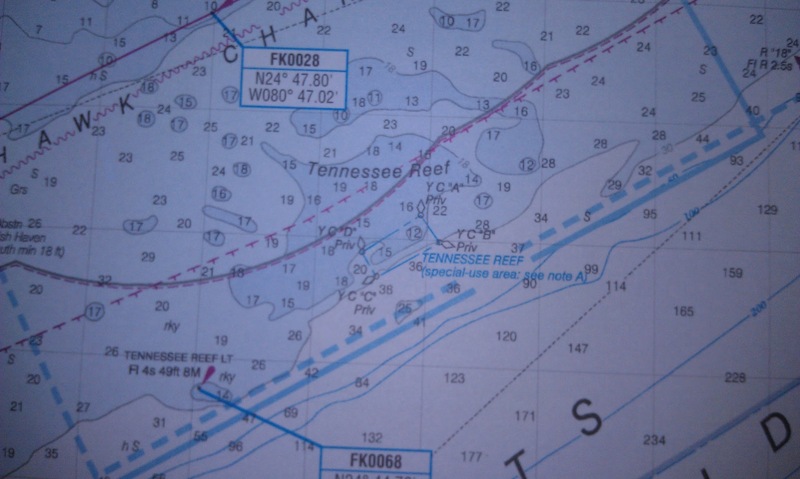 On the way to Marathon we came by Tennessee Reef which was a surprise. Of course I had to Google it to find out more information. 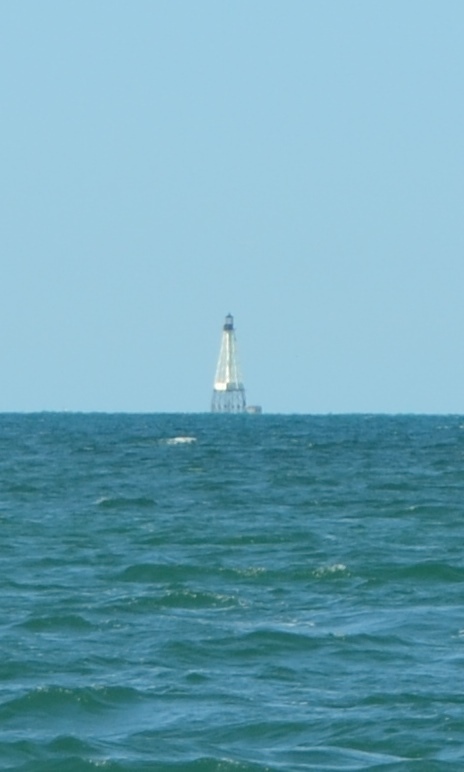 In the late 20’s and early 30’s several non-manned lighthouses were built to mark the reefs along the Florida coast. Tennessee Reef Light was constructed in 1933. It is the only one to still have its Fresnel lens and lights. 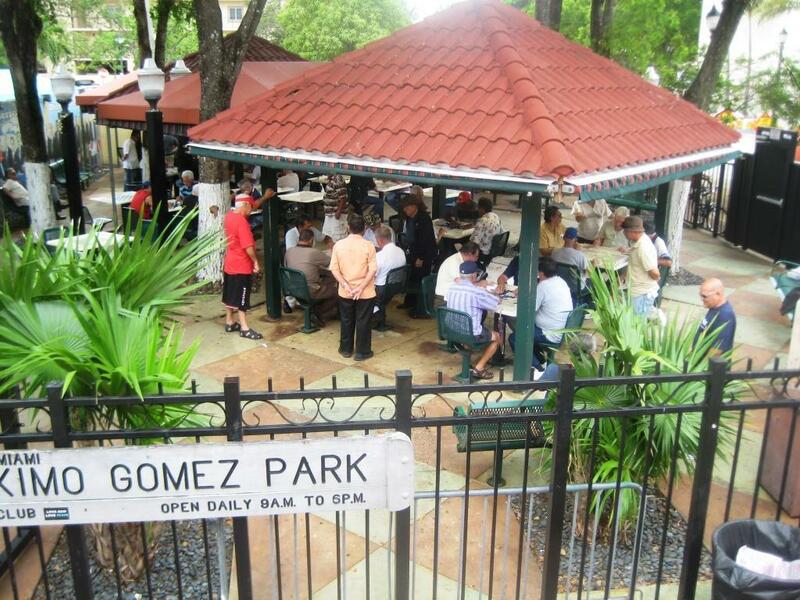 Thursday, May 2, 2013 We are now at Crandon Park Marina in Miami, Fl. 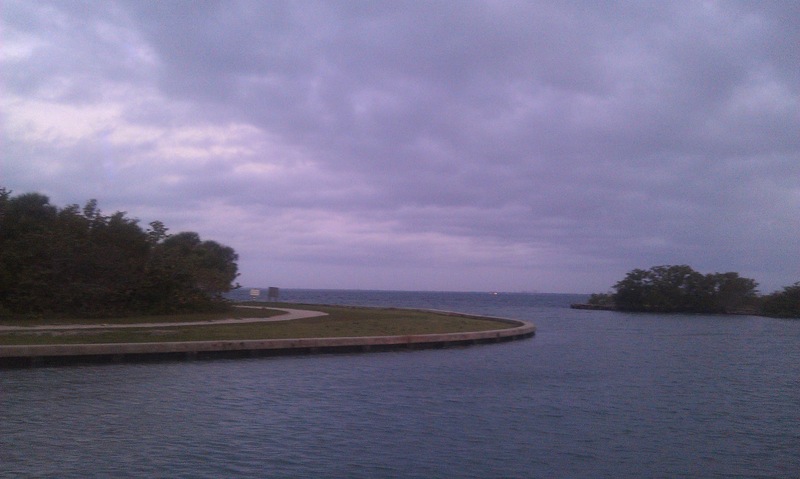 Our plan was to leave for the keys yesterday from No Name Harbor which is on the southerly tip of Key Biscayne, but the weather did not cooperate. The forecast for Wednesday was lower winds which we had been waiting for, but a low front begat storms. 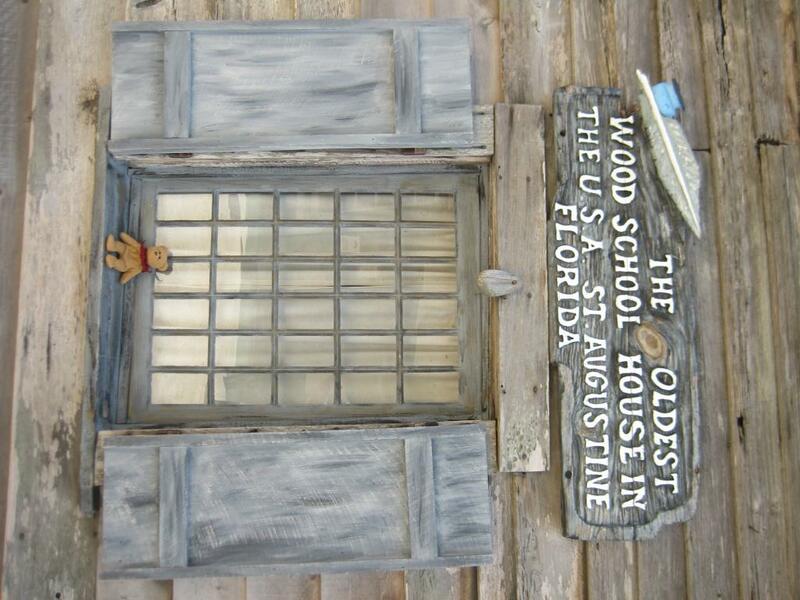 Monday morning appeared to be ok for traveling, but as the day progressed the weather deteriorated. After weathering torrential rains, we are glad we have waited. The next good weather window looks to be Saturday or Sunday. If we had to wait out the storms, we decided we would like to have electricity, plenty of water, and a laundry. Crandon Park has these amenities, but unfortunately the showers are cold. I mean literally, there is no hot water. 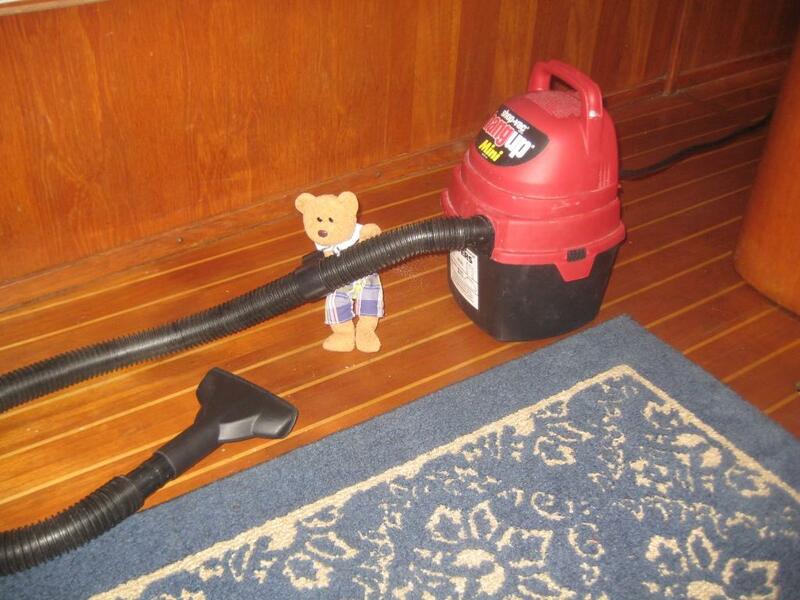 With unlimited water and electricity at the dock, we can shower on the boat. Not quite the same as a hot shower on land but will have to do, and the price is right. Today we decided we would take a city tour of Miami. After studying the bus transit map, we walked to the entrance of the marina, crossed the road to the bus top to wait for the bus that is supposed to come every 20 minutes. As we were crossing the road, a patrolman told us that that bus stop had been eliminated and that we would have to walk across the bridge to the next stop. It looked to be about ½ mile so off we went. At the next stop, there was a sign stating that that bus stop was also not on the route any longer. Ok, we then walked another ¼ of a mile to the next stop. By the way, all this time not a single bus has passed on either side of the road. About 30 minutes later a bus finally rolls up that took us downtown. 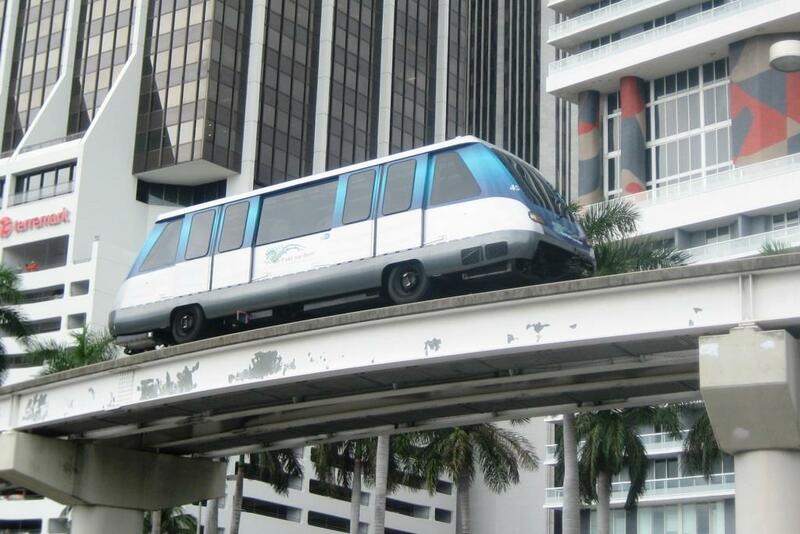 Once downtown we caught the Metromover which is kind of cool. First of all it is free and is a small train that moves on tires on a track without a driver. It is computer controlled. It reminded me of the trains that the Dauntless rode in the book Divergent. We didn’t get on the right loop at first, so we got off and caught another one. After getting off, we then walked about several blocks to Bayfront Park where we bought tickets for the Red Bus City Tour. It had only taken us about 2 hours to get there! Not a very efficient use of our time this morning. Oh, well we certainly have time to spend at the moment. The tour had two parts, downtown and the beach. First we did the downtown and then came back and caught the bus for the beach tour. The buses are double-decker so of course we sat on top for the first tour, but by the time the second one started threatening rain clouds had formed so we chose a seat inside. As soon as the bus took off, the rains came in sheets!!! The bus leaked like a sieve. Water dripped through the light fixtures, ran down the steps from above, and coursed down the floor. The guide passed out plastic ponchos. It was all very comical. We could hardly see out the windows for the condensation and the hard rain. 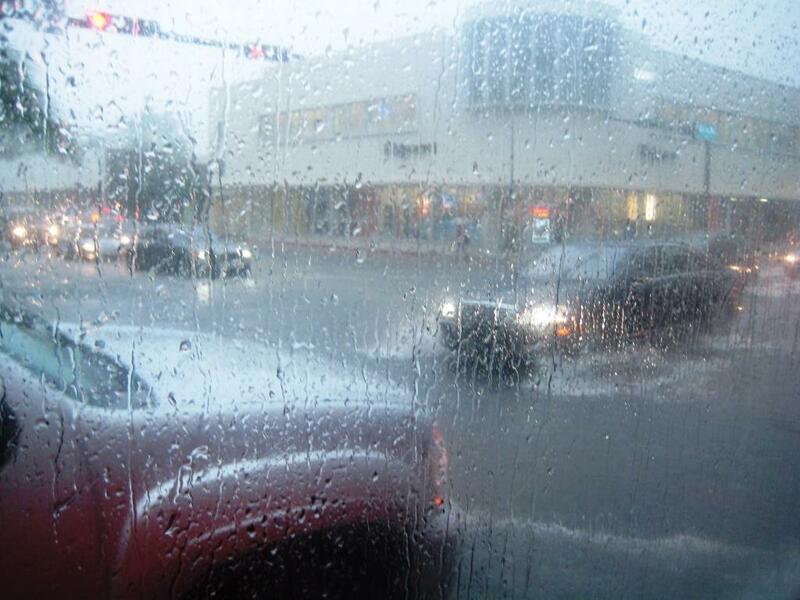 Many of the streets in South Beach were flooded. It was a much different South Beach than we had seen last week. 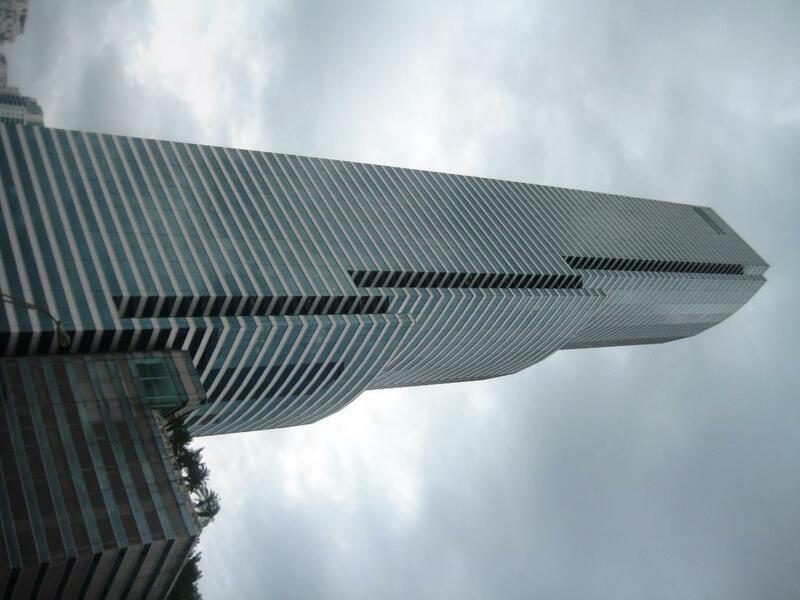 The Miami Tower also called the “cake layered building” Lights up at night with changing colors for the holiday, etc. We decided to splurge on a taxi to come back. I am in my jammies, and James is taking his pre-bedtime nap. Tomorrow is another day. We have now been to two marinas that have pump out at each slip that you do yourself. 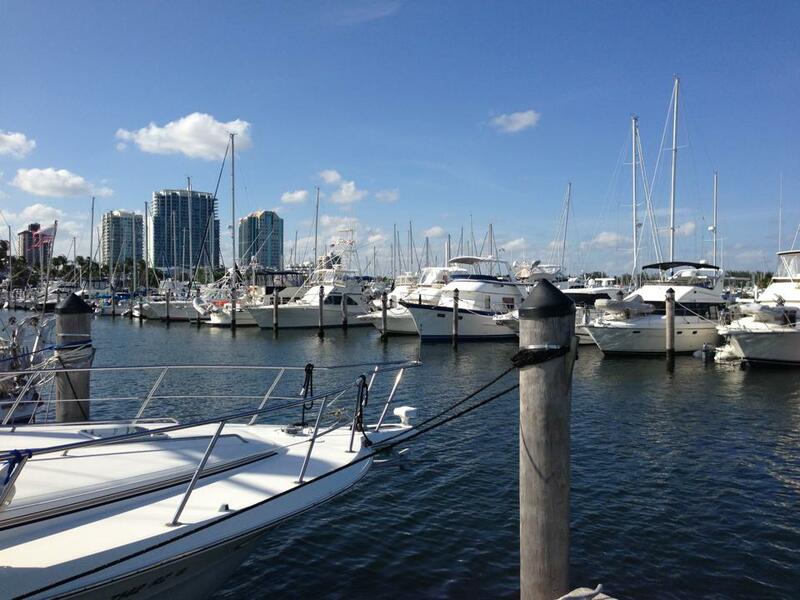 I was impressed when I heard that at the first marina in Fort Lauderdale. How convenient…no need to go to the pump out dock. Now I am remembering that do it yourself is not always all that great. At the first marina, they had misplaced the hose, so we had to wait until the next day. When we tried to get the hose then, the office was closed early. After a phone call, they promised we could do it at the pump out station the next morning before we left. We ended up needing to leave earlier than they were open so we skipped emptying our holding tanks. With two heads on our boat, we can function ok if one tank gets full. 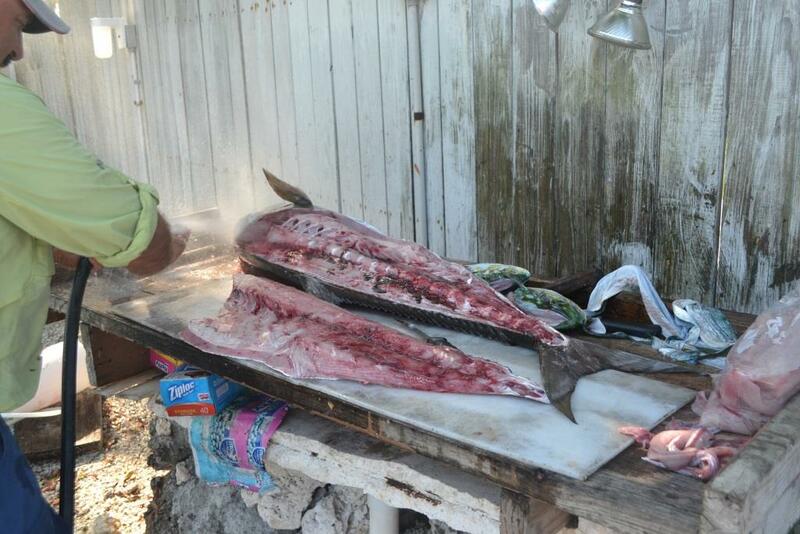 Now we are three days later at Dinner Key Marina where once again they flout dock side pump outs. The marina has 582 slips and only two hoses…one 25 feet long and one 15 feet. We finally managed to secure a hose today. One tank was overflowing, and I had the lovely pleasure of opening the valve and holding the hose while James had to be on the dock and press the button. We pumped both holding tanks and then when we put the hose in the water to clean out, the pumping station quit necessitating a phone call to the marina office. I’ve concluded that I would rather have them pump me out at a station…certainly more reliable. 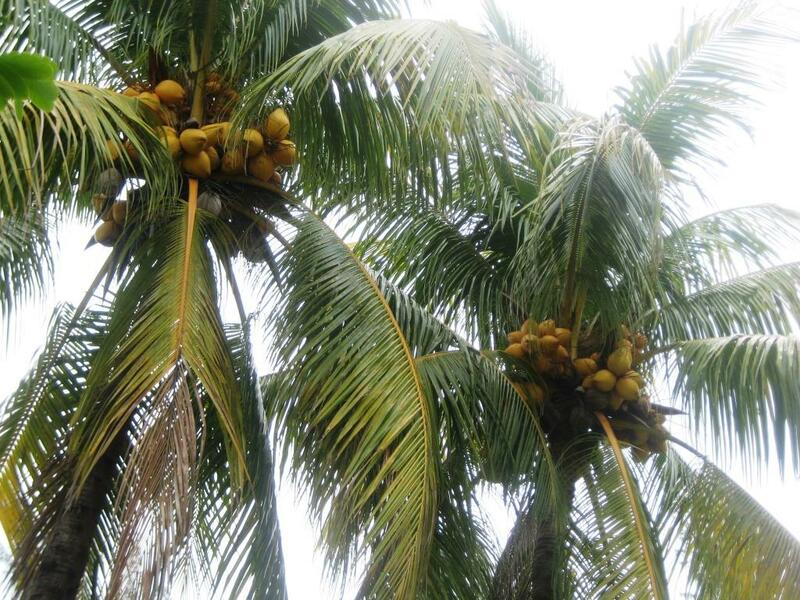 This afternoon we walked into Coconut Grove. 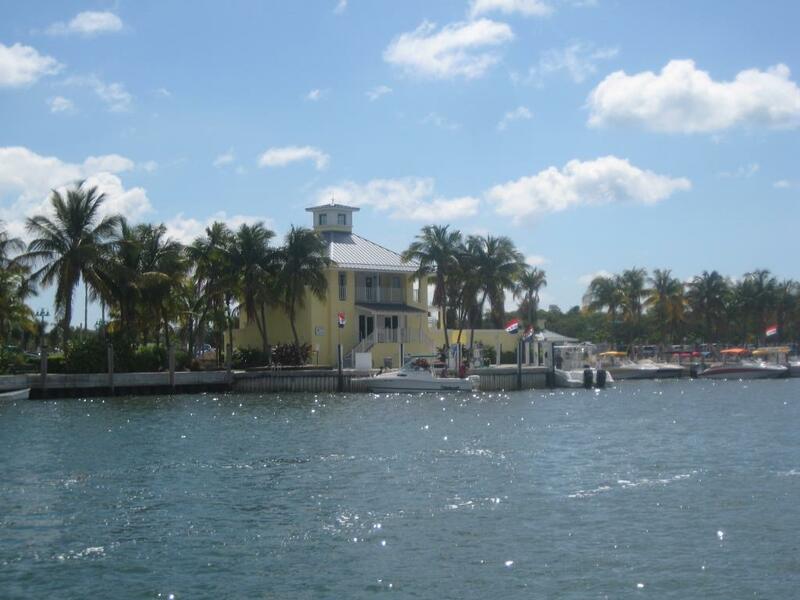 I left James at the Coconut Grove Yacht Club “strange talking” with some sailors about sailing through the Keys. After a bit of window shopping, I actually bought a dress that was on sale (the only kind of shopping I really like) that I think I might wear to a wedding later this summer. James then met up with me, and we shared a meal and dessert at The Cheesecake Factory. We skipped supper since we both were so full-even with sharing. James walked the docks this evening while I colored my gray roots. When he returned we ate popcorn and watched a movie on our computer. Every day is not exciting. Dinner Key Marina used to be the site of the PanAm Sea base. I am copying James’ post on Facebook about this PanAm. We spent the last few nights in Coconut Grove in Key Biscayne which is about 7 miles southwest of Miami. The marina is Dinner Key, and it is huge. At one time is was the base of the PanAm clipper fleet. 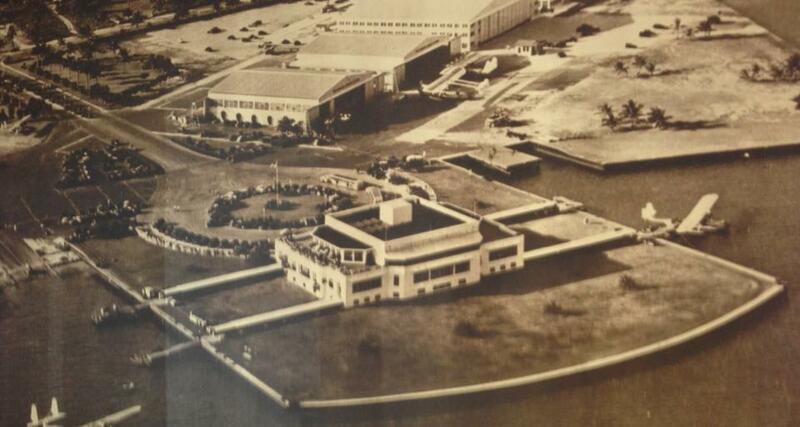 They needed sea planes because they serviced Cuba and South America which had no runways. 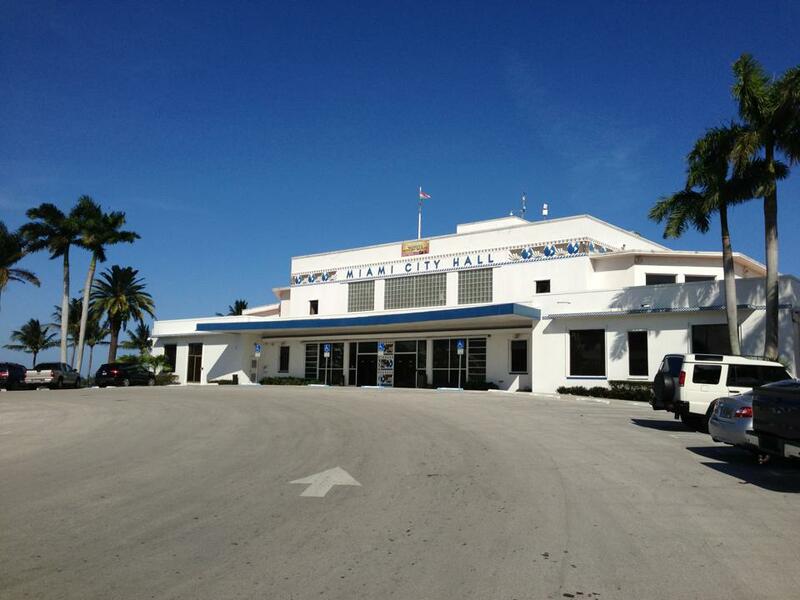 The old terminal is now used as part of Miami City Hall and one of the hangers is used for various city functions and in the filming of the TV show “Burn Notice”.